The Crater of Diamonds Mine is located in the south of Murfreesboro, Arkansas. Back in the late 1800s, geologists conducted research on ground that appeared like green dirt after suspecting it might have contained some minerals. People had known that Arkansas was rich with quartz crystals for centuries. Years later, in the 20th century something amazing happened. A local farmer by the name of Johns Wesley Huddleston bought a piece of land near Murfreesboro, which also happened to be part of that greenish volcanic material. In August of 1906, he discovered the first diamonds on his land. Without wasting any time, Huddleston sold his land to a commercial mining company for $36,000. As soon as the news spread about the discovered diamonds, there was a diamond rush in the area. After the land was bought from Huddleston, the Arkansas Diamond Company was born. However, not every part of the land was owned by Huddleston. A man named M.M. Mauney also owned the other side of the diamond bearing area. Sooner than later, Mauney was unable to extract any diamonds by himself using his means, until he finally sold a three quarter interest in the property to Horace Bemis who later put in place the Ozark Diamond Corporation. After his passing, Mauney’s heirs were not interested in diamond mining. As a result, it created an opportunity for Austin Millar and his son Howard who bought Bemis’ share of the property. They also tried to negotiate for the other quarter space from Mauney, but to no avail. When the Millars bought Bemis’ share, they managed to establish a commercial diamond plant successfully, until the whole installation got burnt down, leaving behind nothing to rebuild. In 1969 another independent company known as General Earth Minerals of Dallas came and bought the entire property, but the site could not be commercialized for mining. It was instead continued as a private tourist attraction site, until 1972 during which the state of Arkansas purchased the land at the cost of $750,000 to develop as a park for the state. The park is now open to visitors where they can embark on a treasure hunting adventure in Arkansas at the Crater of Diamonds which contains the diamond bearing soil. The visitors are only required to make a normal payment to have access to the search areas. Hunting here is easy. Simply walking systematically up and down the rows while looking for diamonds lying on top of the ground is a great way to spot diamonds. The ground is periodically plowed, bringing fresh diamonds to the surface of the soil. All it takes is a sharp pair of eyes. In case one would prefer digging, it is allowed to go with personal tools. Better still, there is a provision for renting or buying the tools right from the park depending on what one finds convenient to do. When one decides to go for the option of renting the tools, they should prepare a renting fee for a specific tool as well as a deposit fee which is refundable if the tool gotten on rent is brought back in good shape as one got it. One might think that years and years of diamond mining at Crater of Diamonds would make this area a poor place to mine today, but there are still diamonds here! In fact, it seems that every few years there is a story about someone finding a nice diamond weighing several carats! The best time to hunt is right after the ground has been plowed. This brings fresh diamonds to the surface. Anyone has a chance of making the find of a lifetime! 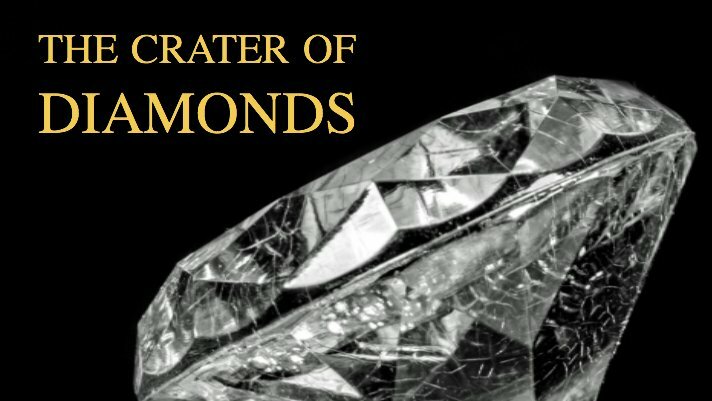 Crater of Diamonds offers a diamond mining experience that is unlike anywhere else in the world.